MEGAMUD is so much more than just a mud. This advanced facial treatment mask is formulated with powerful age-fighting peptides to rejuvenate your skin and restore your natural radiance at any age. Nutrient rich clays and botanicals visibly extract impurities from the pores to clear the skin of problematic dirt, oil, and toxins. Tones complexion and tightens pores to reduce size. Softens, smoothes, and brightens skin for a silky, youthful looking appearance. POWERFUL ANTIOXIDANTS. Green tea, pumpkin, pineapple, and pomegranate team up to fight free radicals, support proper skin regeneration, and combat the effects of aging. The superfood Argan Oil infuses powerful healing, moisturizing, anti-inflammatory, and anti-aging benefits for protecting and maintaining healthy skin. 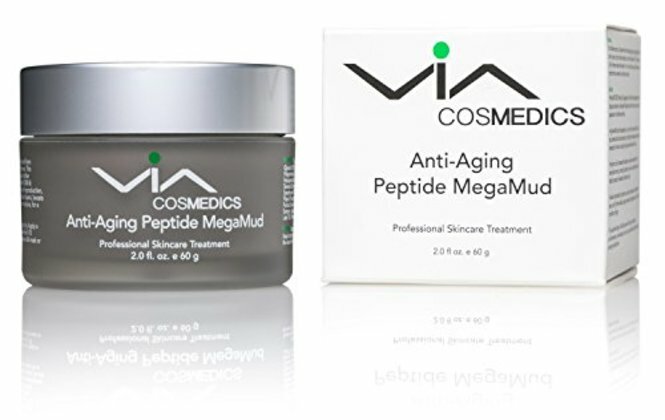 AGE-FIGHTING PEPTIDES. Matrixyl® 3000 (Palmitoyl Oligopeptide & Palmitoyl Tetrapeptide) boosts collagen production, stimulates fibroblast cells within the skin, and reduces wrinkles and lines. Argireline® (Acetyl Hexapeptide) relaxes facial muscle tension by inhibiting the release of neurotransmitters, resulting in reduced wrinkles and lines. HYALURONIC ACID increases absorption and retention of water, up to 1,000 times its weight, giving the skin added fullness and providing a firmer, more youthful complexion. It promotes hydration, volume, and density necessary for healthy transport of essential nutrients to cells.